The struggle for control of the mainstream media narrative in New Zealand is always fascinating to observe and, thanks to the explosive pre-election whistle-blowing of Nicky Hager’s book Dirty Politics, increasingly so. Arguably the largest political scandal in the history of our small country, Dirty Politics is more about the media than they care to admit. While framed by them as a debate about bloggers, the implications for, and insights into the machinations of establishment journalists are of far greater consequence to the New Zealand public. Unfortunately, investigating the corruption of the mainstream media and examining their own part in the subversion of democracy does not suit the strategic goals of profit-driven corporations. Which is seemingly why the rash of mainstream confessions published on major New Zealand news sites soon after the release of Dirty Politics, included this one that featured an addendum by the very editors of the publication – a post-script that publicly ratified, supported and forgave their wayward employees, on the spot. In P.R. circles, it was a tactic known as front-footing. In other words, answering questions before they are asked, but better yet, from their perspective, framing the subject while addressing only the angles for which they have prepared their defense then hoping the facade of solidarity appears strong enough to deter any further probing. Indeed the blending of the disciplines of journalism and P.R./lobbying are exactly what has got the New Zealand media into this mess. Any journalist who deals with a political-payroll blogger is one degree of separation away from liquid spin. NZ Herald editor Shayne Currie and editor-in-chief Tim Murphy leaping to such quick defense of their erstwhile staff members makes them seem hypocritical. “the APN Editorial Code of Ethics was that: ‘Journalists must not participate in community or political activities that compromise their work or their publisher’s credibility or objectivity'”. At face value, the Devil’s advocate would say; journalists receiving information from sources across the full political spectrum does not violate that code. We would be inclined to agree. But what about journalists supplying information to sources they know might use it to engage in paid political activities? In light of these events and particularly the speed with which Jared Savage’s editors exonerated him, I find it impossible to imagine that the public can retain confidence in our mainstream media going forward. August 30 was a very interesting night on Twitter. For the first time ever I saw Kiwis engaging en masse in OSINT – in laymans terms, putting their heads together to pool scraps of publicly available information and analyse it. Such analysis is usually the realm of media organisations and intelligence agencies, but where the aforementioned fail in the pursuit of truth and democracy, the public are now filling the gaps. 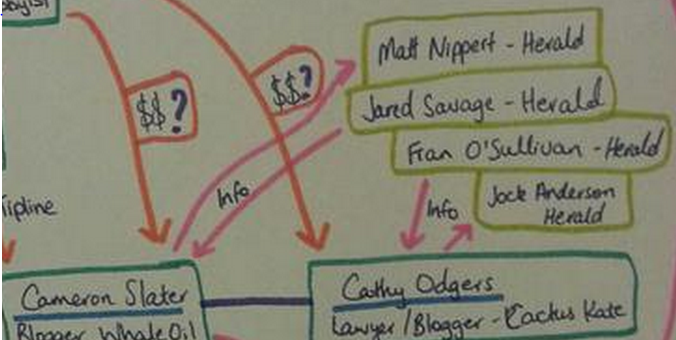 The end result was this stunning visual representation of the insidious implications of the #DirtyPolitics scandal, involving no less than FOUR NZ Herald journalists. (Be sure to examine the arrows that flow to and from these journalists; making it clear that in at least Savage’s case, the information was going both ways). While it was very clever of the Herald to use pictures and text in their diagram, it was missing one major piece. Four, actually! It doesn’t seem so long ago that Occupy NZ was telling the mainstream media “You Need Not Fear Becoming Julian Assange“. Now even political parties are learning to call out the media. The Internet Mana Party, which has run an extremely innovative and current digital media campaign in the face of constant mainstream media smears, “dirty ops” and black-outs, is now circumventing the 6’o’clock news sabotage of their campaign by releasing its own news program. 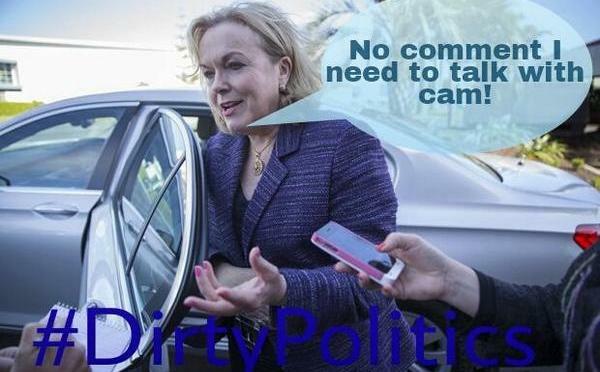 In the aptly titled “Not The 6’o’clock News”, Internet Party leader Laila Harre turns the cameras on the press pack, calling out their “casual media bias” and enjoying a platform to push policy and campaign updates that is free of corporate ambush or malicious editing. Who can blame them when it is so clear that Dirty Politics is still in operation. The most recent anti-Internet Mana Party mainstream fluff (and that’s putting it kindly) is by one of NZ’s most lauded commercial journalists, TV3 Political Editor Patrick Gower. His opinion piece addressed to indigenous political leader Hone Harawira, “Dear Hone, Harden Up” is extremely ill-conceived and adds weight to the allegations of insiders that the press gallery do indeed all chase the same political “story” – whether or not it is a story. To demand of all people, that Hone “harden up” is extremely audacious. “I know Hone Harawira well” claims Gower. Well then, Patrick would have had the scoop of the year when Hone’s office was recently shot at by persons unknown, yes? No. TV3 reported the incident six days after it occurred, and gave it comparatively little news time. Astonishingly, the TV3 article about it has 0 social media shares and 0 comments on it. Even Willie Jackson called out the obvious bias in the media. The Daily Blog described the mainstream media as being “indifferent” over it. Less than two months later – this 85-word 3News report (with 9 shares on it) that Hone Harawira has been in a near-fatal car accident in Northland. Adding in the context of Cameron WhaleOil Slater’s court battle to prevent his own emails from being published, despite having spent years profiting off the leaking of the private information of countless other people (including many instances of facilitating the leaking of emails and other content), this week’s press gallery furore over – you guessed it – leaked emails (this time Hone Harawira’s), is even more ridiculous. Just as Hager’s book Dirty Politics showed us – the media has (again) focused in on a triviality fed to them (whether Harawira did or did not approve of/disagree with a campaign marketing idea) while completely ignoring the bigger picture of his office being shot at, car running off the road, and the real reasons behind his recent low profile – all of which clearly have nothing to do with marketing at all. Not to mention the issue of who leaked the Harawira emails and why? Tellingly, Harawira didn’t go running off to the High Court to seek an injunction against the media, ala Slater. Is that why the media feel they have free reign to nakedly resume their anti-Internet Mana agenda? Have they been sufficiently cowed by WhaleOil’s threats and court actions to once again run his lines, and target his opponents? Apparently so. This – you guessed it (again) – TV3 article by Tova O’Brien is so full of conjecture and misnomer it deserves an entire counter-response all of its own. The first line proclaims a “major breakdown in the Internet Mana Party” and from the 146 shares already on it, suggests the article has enjoyed a much better placement, promotion or site referencing than Hone Harawira’s office having been shot at or his car running off the road. …making it abundantly clear where the mainstream media’s interest lies, where the Internet Mana Party is concerned. In a foolhardy attempt to corroborate TV3’s accusations of a “major breakdown”, O’Brien references Internet Party Press Secretary Pam Corkery calling Brook Sabin “a “puffed-up little s**t” for trying to interview Dotcom at the Internet Mana election launch last month”. Yet again the truth falls victim to an obvious omission, clear to anyone who has viewed the footage. We, the public, have no idea what Brook Sabin said to Pam Corkery that led to her “puffed-up little s**t” comment as TV3 helpfully edited out the context and led their 6’o’clock news coverage with those precise words. But what Pam is shown saying to Sabin and his fellow corporate news talking head Michael Parkin of TVNZ afterwards gives a hint at the truth behind the sensation. This means that the footage TV3 broadcast to the nation was the result of at least the fourth time that Sabin, Parkin et al had demanded to interview the Internet Mana Party patron, in an attempt to focus on Dotcom’s legal history in lieu of interviewing party candidates about the launch. So where is the footage of them asking the first three times? Is that not newsworthy? Would their badgering not provide context as to the real source of Corkery’s exasperation? A Google search for Pam Corkery’s outburst leads straight to Cameron ‘WhaleOil’ Slater’s You Tube account. The video is posted the same day as the TV3 coverage – 24th August 2014. Is it a coincidence that it is posted on his channel? Or is there a connection between TV3 and WhaleOil, as with so many other mainstream New Zealand journalists and publications? 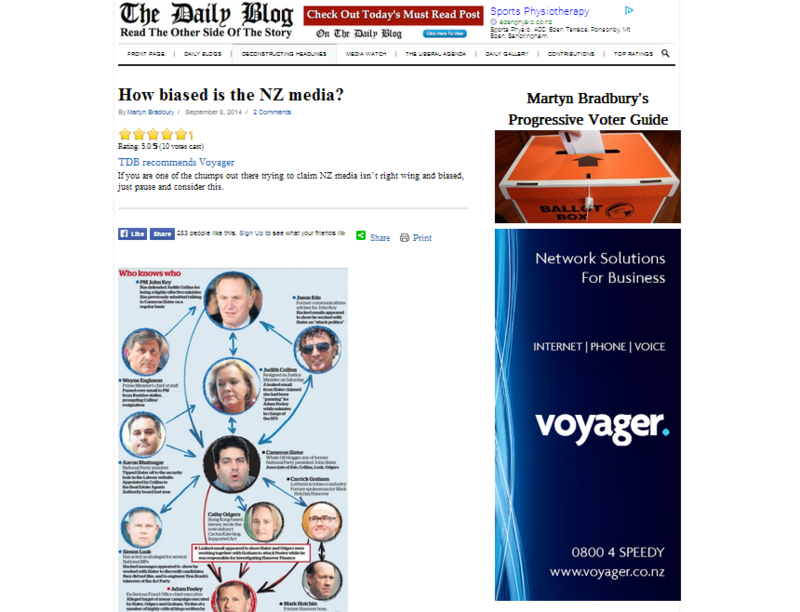 Is it coincidental that TV3’s relentless anti-Internet Mana Party coverage aligns with WhaleOil’s stated aim of destroying Kim Dotcom, as outed by Nicky Hager’s Dirty Politics? Or does the nefarious continuation of WhaleOil’s Dirty Media Ops penetration of mainstream sources prove that the WhaleOil pro-National cabal is not only in full swing but full steam ahead, just as he himself suggested? In a recent Twitter exchange, Slater directly tweeted at me that he was “more robust” than I think. I would love to embed the tweets for your viewing pleasure but they appear to have been unceremoniously deleted. Just like some of his blogposts. It appears it is not only the mainstream media practicing sanitising content to shore their personal positions. In the course of writing this article two new twists have unfolded. Firstly, WhaleOil has partially succeeded in exerting legal pressure to gag the very mainstream news organisations that are supposed to report in the public interest. Bearing in mind that the organisation reporting in this article about it, is yet again, TV3. Who you would think, with their parent company listed as one of the defendants in WhaleOil’s suit, would be diametrically opposed to his position.Yet when analysed at a meta-level, the revelations of media complicity in Dirty Politics and the political angles routinely asserted by the organisations in question may point to them having a covert stake in the suppression of any further coverage of the WhaleDump leaks – perhaps as much so as WhaleOil himself. Indicating that perhaps it is not Hone Harawira, but mainstream media stalwarts, that need to “harden up”. The second major development that is unfolding is a protest of 100+ people on the steps of Parliament. Funnily enough we didn’t hear about this on the news, but sure enough, we did on Twitter. The New Zealand public are the unknown quantity in the Dirty Politics charade. If actions like these continue, the mainstream media will be forced to fall into line. Because if there is one thing they dislike more than being sued – it is being scooped by citizen journalists. The fact that little-known accounts of random members of the public are now livetweeting and livestreaming seemingly-spontaneous actions at Parliament, without the support of any central organisation, supports the theory that the Awakening is spreading, and that regardless of state interference, the truth on the ground shall prevail. One way or another, the revolution WILL be televised. Nothing sticks to Teflon John | Planet Key is Awesome ! !